Sean Connery’s James Bond is introduced to us in 1962 in Dr. No wearing a traditional midnight blue shawl-collar dinner suit (tuxedo for the Americans) made by tailor Anthony Sinclair. The shawl collar and all other silk trimmings are in midnight blue satin silk. A nice feature is the silk gauntlet cuffs, the turn-back at the end of the cuffs. It’s an Edwardian decoration, and perhaps the only purpose of them is when they wear out they can be replaced. Otherwise, the cuff fastens normally with four silk-covered buttons. Like any proper single-breasted dinner jacket, this one fastens at the front with only one button. Only in Licence to Kill does Bond mess up with two buttons on the front of his dinner jacket. 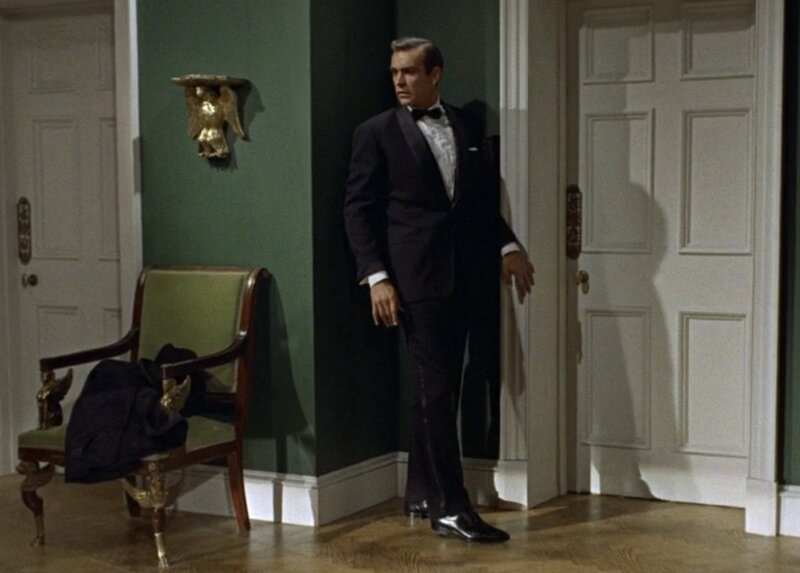 Traditionally a dinner jacket should not have vents, but it is acceptable for a man of action such as James Bond to have two vents at the back. If you insist of wearing a dinner jacket with vents, make sure there are two, never one, as two vents are more formal than one. The trousers have a traditional rise with double forward pleats, as is typical of English tailoring, and of course the silk stripe down the side of each leg. The shirt is the standard one worn in England with black tie: a white shirt with a pleated front, spread collar and double cuffs to take cuff links. Connery’s shirt is made of a luxurious sheer voile, a high-twist plain-weave fabric usually made of cotton. The buttons on the front of the shirt are the usual mother-of-pearl buttons that are found on any well-made shirt. Some may insist on studs for black tie while others only wear them with white tie. James Bond does not wear studs very often. According to director Terence Young this shirt is from Lanvin. Now take a close look at the bow-tie. You will notice the diamond pointed ends. This is not an easy thing to find these days, particularly in such a narrower shape. His breast pocket is adorned with a simply folded white linen handkerchief. On his feet he wears black socks and black patent leather (or just well-shined) cap-toe oxfords. 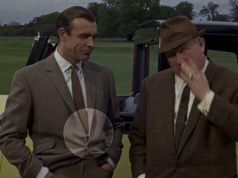 When Bond is travelling from his club to the office, he puts on a navy chesterfield coat and carries a black homburg, the most appropriate outerwear for black tie. However, there is one thing missing here: Bond does not wear a waistcoat or cummerbund. 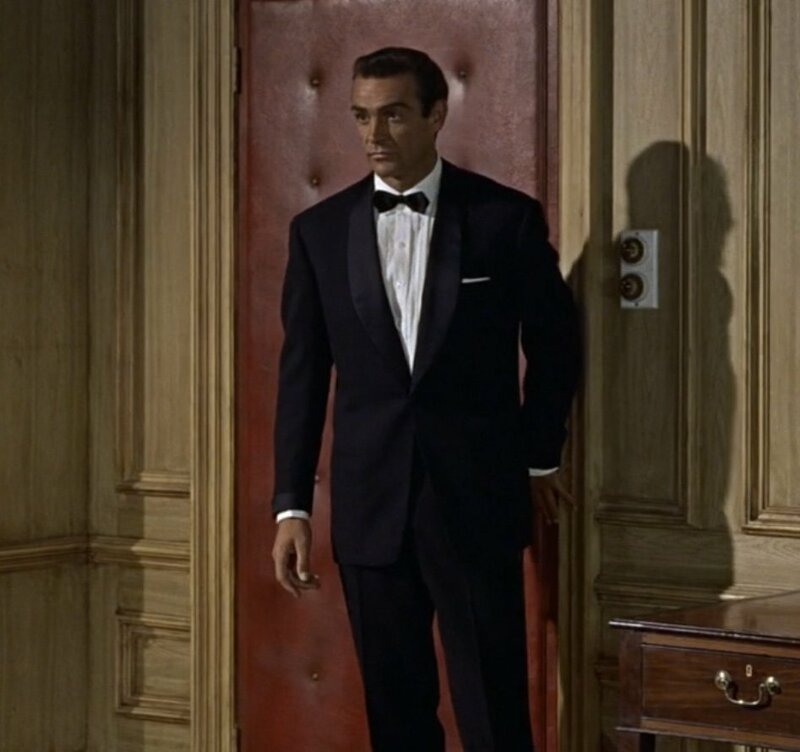 Occasionally Bond has worn either but more often than not he goes without a waist covering. Bond’s black tie outfit worn in Quantum of Solace pays homage to the original but with a few changes: this time he wears a cummerbund and his trousers do not have pleats. And apart from the width of the lapels, every other detail is the same. Both are within the realm of classic style and neither will ever look dated. 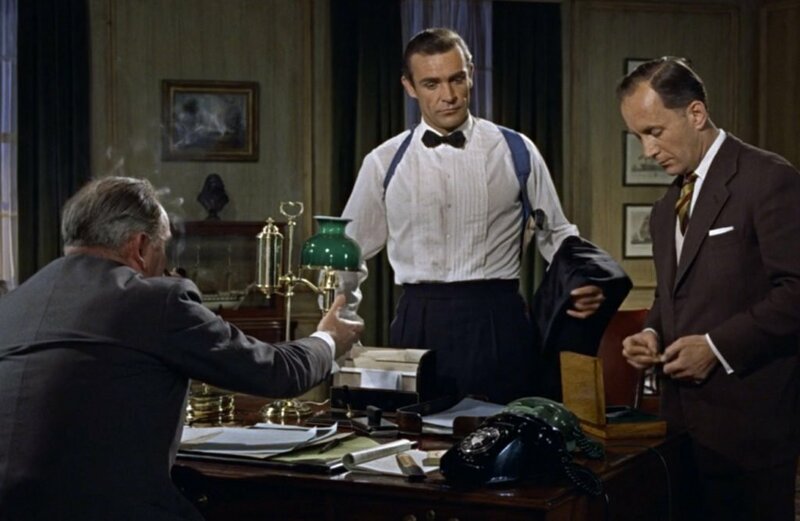 This concludes the first post on The Suits of James Bond and for the rest of the week we will continue to talk about the clothing Bond wears in Dr. No. Is the shirt really Lanvin? The placket looks like Turnbull & Asser. Terence Young said it was Lanvin. A lot of brands make their plackets like that. I have other Jermyn Street shirts with that type of placket, like from New & Lingwood and Hilditch & Key. Ah, I see. I had thought that was something exclusive to them. Was that from an interview with T. Young? Would like to know more! I believe it was on the DVD commentary. Funnily enough, Frank Sinatra wore a Dinner Suit similar to this in the film Blow Your Horn. I don’t think it’s the same one though, as the lapels look narrower. 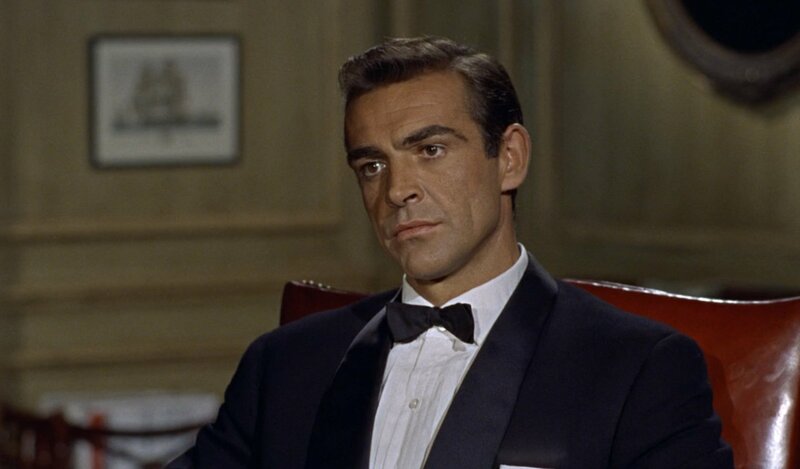 Matt, I can’t find your article about the dress watch worn with the dinner suit in Dr. No. I hope it isn’t lost ? Could cocktail cuffs be worn with a dinner jacket which has gauntlet cuffs? Sure, it can be done. Roger Moore wore cocktail cuffs and gauntlet cuffs together in The Saint and in The Man with the Golden Gun. I can proudly say I am an owner of the midnight blue dinner suit tailored for me by Mason & Sons, it’s the most treasured piece in my wardrobe by far very happy. congratulations on your purchase on that fine piece of history. I would like to ask some questions if I may? 1. I’m thinking of going bespoke with my tailor here in California on recreating the suit. Do you think I should just stick to the special order full canvas version of the suit from mason and sons? 2. 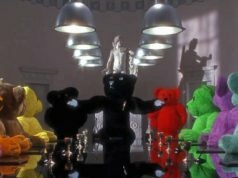 What cloth or suiting is the suit made out of? I heard it’s carlo barbera which in many circles of the golden scissors it’s nothing special. What’s your take on it? 3. Did you buy direct off the peg or a special order? 4. If you could change anything about it what would it be? 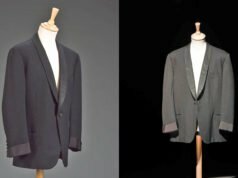 The standard ready-to-wear and special order Anthony Sinclair suits are made of cloth from Vitale Barberis Canonico (VBC), which is a very good cloth but nothing extraordinary. Carlo Barbera is better, though I always recommend fine English cloths over Italian. You can get better cloths in the Anthony Sinclair Special Order suits if you like. 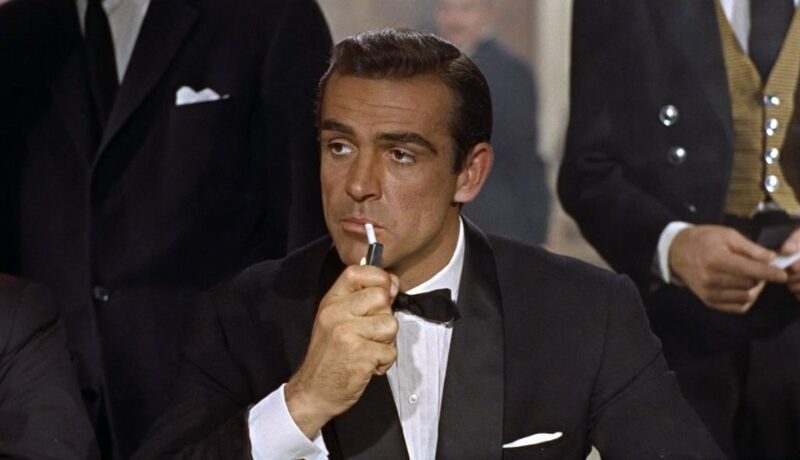 in the tradition of bond which cloth do you recommend then from the selection mason and sons would have? The midnight-blue faille-weave that they use for the ready-to-wear dinner jacket is a great choice. The choice should be a faille or barrathea wool, or a plain-weave or basketweave wool and mohair blend. I do not know what choices they have, since only a small amount of the cloths you can choose from are on their website. How can you recognize the shoes are cap-toe Oxfords? Cos to me they look like plain toe Derby. im assuming the shoes dont have laces? do laces make a shoe less formal? Would you ever consider doing a post on the dinner suit worn by Robert redford in the film spy games. He plays an American spy master and I thought the dinner was brilliant! Sorry, I don’t think I would do it.